Backers of a business incubator in downtown Augusta say the project could once again make the historic Woolworth Building the “heart of commerce” in the central business district. And, in the process, make Augusta more hip among millennial entrepreneurs. The project at the corner of Eighth and Broad streets, known as the Augusta Innovation Zone, is being touted as a co-working space where young entrepreneurs can rent everything from a single desk all the way up to a 3,000-square-foot office suite. Envisioned as a smaller version of the Atlanta Tech Village, the proposed startup accelerator would occupy all 43,000 square feet of the Woolworth Building on the southwest corner of the intersection, plus parts of the Johnson Building at the southeast corner. “This will return the historical significance back to Eighth and Broad – and we’re really excited about it,” said Tommy Wofford, co-founder and CEO of the Augusta-based tech company MealViewer and one of the project’s six investors. The other Augusta Innovation Zone partners include former Augusta Mayor Deke Copenhaver, Unisys Vice President Tom Patterson, Meybohm Vice President John Cates and Augusta restaurateur George Claussen and his sister Virginia, a marketing and brand-management executive for Copenhaver’s consulting firm and weekday radio show. Wofford and Cates said at an information session Thursday that the group hopes to open the facility by the time the state’s $50 million Georgia Cyber Innovation and Training Center at the Augusta Uni­versity Riverfront Campus is completed in the middle of next year. Cates said space will be sold in membership tiers, with the Woolworth Building’s 17,000-square-foot ground floor housing the least-expensive spaces, including “hot desks” where budding entrepreneurs get a temporary desk with access to shared printers, copiers and a receptionist. The mid-level tier would consist of dedicated desks with secure storage compartments, while the top membership package would include actual office space fabricated out of used 20- to 40-foot shipping containers capable of housing three to six employees. Startup companies that grow beyond that can seek larger spaces on the 13,000-square-foot second floor. The idea is for startup companies to “graduate up,” Cates said. “If you look at Atlanta Tech Village, the top floor has well-established companies that started on the first floor,” he said. Rents have not been finalized, but the investors say they plan to keep costs low by operating the incubator as a nonprofit entity. Above the second-floor offices are plans for a rooftop bar that would be managed by Claussen, co-owner of the Southbound Smokehouse barbecue restaurant and the Friends with Benefits Fund event promotion organization. The 12,000-square-foot entertainment area would feature a small stage area and space where restaurant startups could test menu concepts. For startup founders and employees who want to live close to the space, the second floor of the Johnson Building – the first floor already is partly occupied with commercial tenants – will be developed into about 12 to 15 apartments. The Johnson Building, owned by Dallas Hooks of Evans-based Journey Real Estate Investments, is more than a decade older than the Woolworth Building but is in better condition. The former Woolworth store was constructed in 1939 but has sat unused since it closed in 1991 and is in need of a full renovation. It was bought in 2015 by local developer and hotelier T.R. Reddy. Cates said the Augusta Innovation Zone partners have agreements with both building owners to use the space. The group expects the entire project to cost in the neighborhood of $5 million. 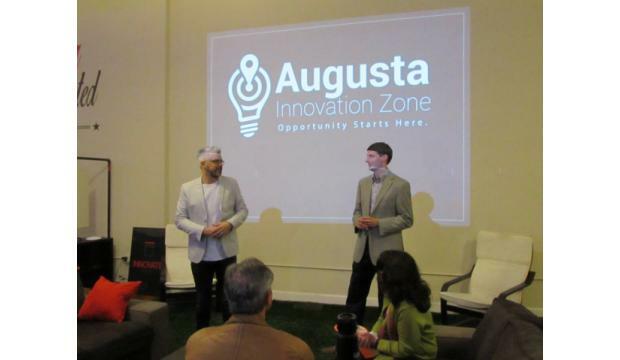 The price will be worth it, however, if the incubator succeeds in helping Augusta become better known for innovation.